“FODMAP stacking” is arguably one of the most confusing parts of the low FODMAP diet. It can leave even the most seasoned of FODMAPPERs undone and newbies running for cover. This is because, unlike a food allergy, the low FODMAP diet is not a black and white approach where one food is ok and another is not. Many foods contain some amount of FODMAP sugars and the FODMAP load will depend on how much of the food is eaten at one time. A small serve, will be lower in FODMAPs and a larger serve will be higher in FODMAPs. The goal of the low FODMAP diet is to limit foods to low FODMAP serve sizes. At Everyday Nutrition, we don’t want food to be complicated, after all we have to eat multiple times Everyday! We believe that food should be enjoyable and not cause stress. If your symptoms are mostly well settled, you are probably doing the right thing for you, so don’t sweat the small stuff. Aim for 3 or more food groups in each main meal – the more variety there is, the less chance you will combine foods with the same FODMAP. 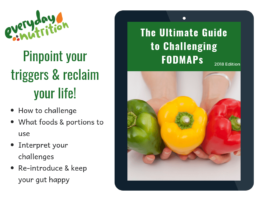 Check your app and work out which FODMAP groups the foods you want to eat potentially contain. If you want to combine 2 foods with the same FODMAP group, the rule of thumb is 1 full serve of one and a ½ serve of the other to stay within low FODMAP parameters. Everyday Nutrition dietitians work exclusively in IBS & gut health. If you are struggling to settle your symptoms or need to troubleshoot contact us to make an apportionment for personalised guidance and advice.